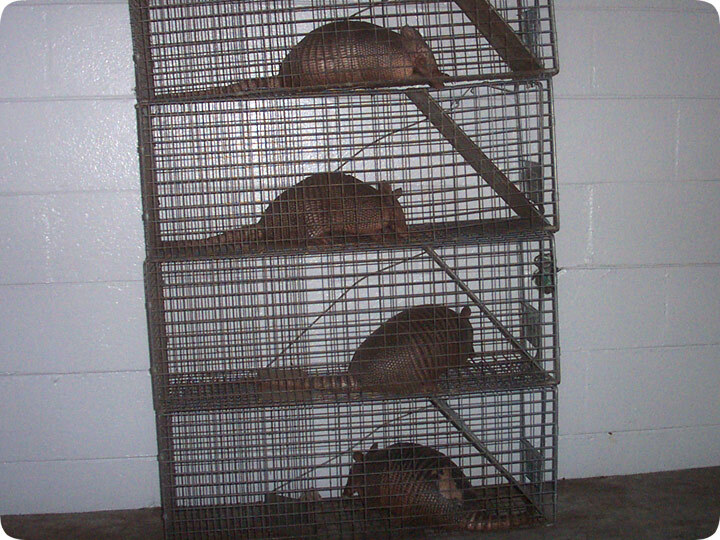 05.18.2005 - Here is a photo of four adult armadillos, all caught in one day. This is the peak of the armadillo trapping season. Well, there is no real season to speak of, since armadillos are active year-round and the population is relatively stable, but for some reason, I get more armadillos at this time of year. These dillos all came from different properties. It's rare to catch more than one armadillo at any given time on a single property. Over a course of days, yes, as different armadillos with overlapping territories cross the area, but in general, dillos are solitary creatures (except for mating time) and a single capture often solves the problem on a property. This photo of a stack of armadillos was taken prior to the nightly release run. If you need an armadillo trapper in Orlando FL, give me a call, or if you live elsewhere, check out my directory of hundreds of wildlife trappers nationwide, and you can find a professional armadillo trapper expert in your area, whether it be Houston Texas, or Tampa Florida. What makes a good armadillo trapper? Experience, mostly, and a knowledge of the animal and its behavior. At one of the four above jobs, the homeowner tried for months to catch the armadillo, to no avail. Turns out he was using an acceptable type of trap, but set in the wrong place and in the wrong way. I came in and caught the armadillo in under 48 hours, by using a system of traps and directional barriers. Armadillo trapping isn't always easy. Where Can I Buy An Armadillo Trap - Buying an armadillo trap is something that many people will need to do when they start to see signs of armadillo activity in their yard or garden, so that they can look to solve the problem. The most common type of trap that people will use when they are trying to catch an armadillo is a cage trap, as this offers the cost effectiveness of being quite competitively priced, and is also very effective. These cage traps are often available from local garden centers and hardware stores, and the cage trap can be used to catch a number of different animals, with those used for raccoons and stray cats being perfectly sized to catch an armadillo. For those who are looking for the most competitively priced traps around it is often possible to find the best deals available online, although it is worth considering the additional costs of postage and packaging. There are some manufacturers who will have tutorials and videos on their websites about how best to use their traps and are able to offer some great hints and tips to help those people who haven't had to try and catch an armadillo before.